We have two different type of kids crafts here. One is our "Just Color It" pillowcase. We have four designs two for boys (monster truck, race car) and two for girls (peace sign, flip flops). The image is screen printed on the pillowcase and just needs to be colored with either crayons or fabric marker. These pillowcase are great for activities during parties, are just something for a raining afternoon. They are standard size pillowcase. Image the joy a child will have using a pillowcase on there bed that they colored themselves. 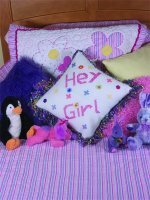 The second kids craft is our "Learn to Stitch" pillows. They are designed to teach emboidery to girls. There are six designs with different skill levels. The pillow is closed on three sides so that after the item is stitched it only needs to be stuffed with a 14 inch pillow form and closed with either fabric glue or stitching to complete. Different embellishments can be added, such as lace or fringe around the outside, and buttons are many other possibilities with fabric glue. These make great accent pillows for the bedroom. 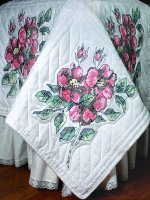 An embroidery color chart and stitching instructions are provided. There are many video instructions on the internet that show how to complete the simple stitches that are used. Most of the stitching on these items are simple cross stitch designs.